Buy Orgran Gluten Free Apple & Cinnamon Pancake Mix - 375g in the UK from our online shop or directly from our independent Scottish store. Maize Starch, Fructose, Dried Apple (Sulphur Dioxide) (7%), Maize Flour, Raising Agents: Monocalcium Phosphate, Sodium Bicarbonate, Calcium Carbonate. Cinnamon (0.9%), Potato Starch, Yellow Pea Flour, Tapioca Starch, Vegetable Gums (Stabilisers): Guar Gum, Methylcellulose. Acidity Regulator: Citric Acid. We sell real Orgran and other Gluten Free Flours & Mixes directly from our shop in Scotland and online throughout the UK. View more products from Orgran. Where can you buy real Pancake Mix - Apple safely online? If you are wondering where you can buy Orgran Gluten Free Apple & Cinnamon Pancake Mix - 375g safely online in the UK, then shop with us. 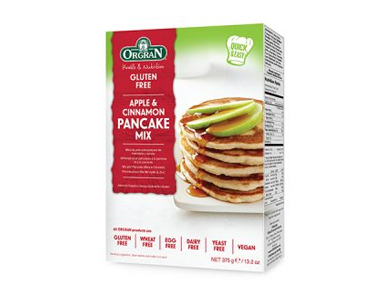 Pancake Mix - Apple - Orgran Gluten Free Apple & Cinnamon Pancake Mix - 375g in Gluten Free Flours & Mixes and Baking.